Classic Industries offers a wide selection of Home and Office Decor for your Chevrolet Caprice. 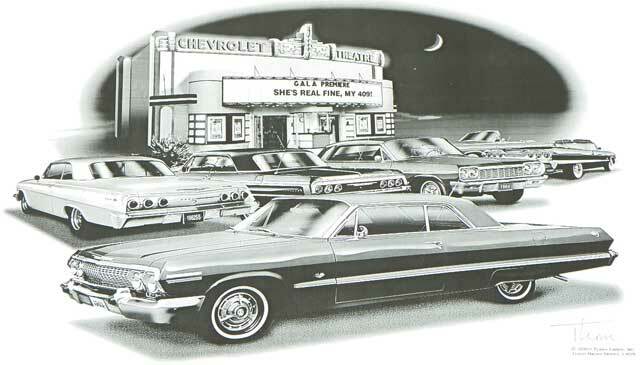 Classic Industries offers Chevrolet Caprice Banners, Chevrolet Caprice Clocks, Chevrolet Caprice Lamps, Chevrolet Caprice Mugs & Cups, Chevrolet Caprice Office Chairs, Chevrolet Caprice Posters & Artwork, Chevrolet Caprice Signs, Chevrolet Caprice Stools, and Chevrolet Caprice Tables. Let's people know you don't want your car touched! Magnetic sign can easily be put onto any surface that is magnetic. Doors, quarter panels, hood and other conspicuous areas. Reserve your spot in the garage or at the office with this beautiful parking sign. Made from .032" thick aluminum, 9" wide x 12" long, with baked enamel finish and screen printed with high quality enamel paint. 1965 Impala Hardtop "Flash Back print"
Display your pride and enthusiasm with this die cut and embossed metal sign. This full color sign brings style, nostalgia, and Chevrolet heritage to the walls of your home, garage, or office. Classic Industries Logo Banner 72" X 30"
Great finishing touch to a showroom, garage or a next event. This Classic Industries Banner is made of heavily stitched vinyl construction and features brass grommets to hang as desired. 1963 Impala Hardtop "Flash Back print"
1965 And 1967 Impala SS "Flash Back print"
This sliding desk tray from the PitStop furniture line is designed to add functionality and compliment the PitStop Desk. Made from metal alloy with glass top. OER Wall Poster 33" X 22"
Get the OER Advantage! This 33" x 22" poster is printed on heavy weight paper and includes a glossy laminated coating. Great for garage, bedroom, or any man cave! Featuring the classic "Nova" script logo, this stool stands 30" high, topped with a rugged vinyl-covered seat that measures 14" in diameter. Complete with a swivel base and chrome-plated legs.